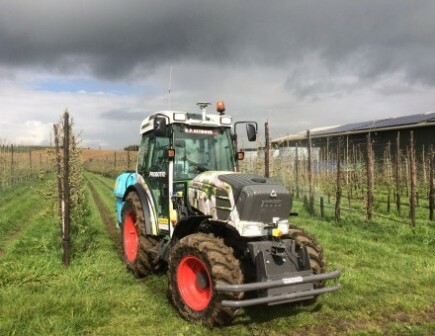 At the BIFGA Technical day in January, Nick Seymour reviewed the key machinery available to top fruit growers and looked ahead to the 'driverless' Fendt Tractor which will be operating on a fruit farm this summer. 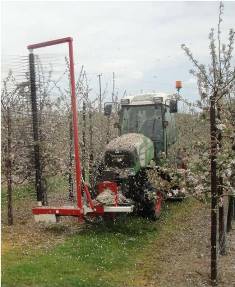 This equipment is a front mounted hydraulically driven machine with variable speed spindle head for blossom thinning of suitably planted orchards; unlike chemical options, the Darwin is not weather reliant. The ability to thin without chemicals is an environmental bonus. Thinning with the Darwin has shown to increase fruit size, colour uniformity and yield, while 'importantly' reducing biennial cropping. Savings have been recorded 'up to' around 80% of thinning costs V's traditional methods. The first Darwin was Introduced by N.P. 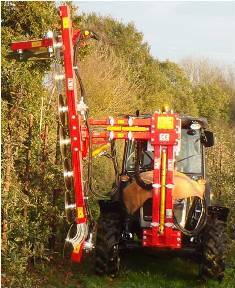 Seymour eight years ago and is now being used in the UK by over thirty growers! Fruit-Tec have now gone further and developed 'SmaArt' Automated tree-specific blossom thinning technology, which calculates individual spindle speed for each tree. A camera in front of the spindle detects the flowering density and the data is relayed via an on-board computer. The system can also be combined with a GPS receiver to capture the location of each tree; the database stores the bloom densities and calculated spindle speed for each tree. The unit can be retro-fitted to existing Darwin blossom thinners. Cutter bars and saw blades are not new but as modern fruit walls have developed mechanical pruning has become more popular for cost cutting. 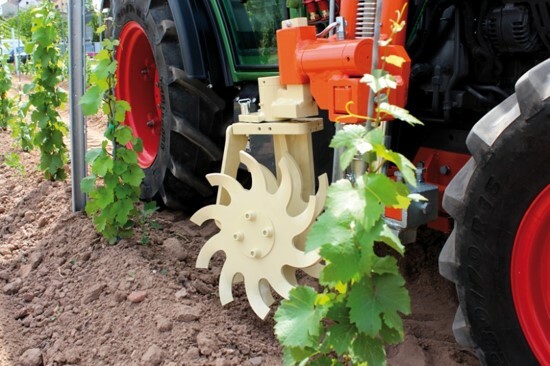 Versatile machines are able to cut fruit walls or hedgerows; winter pruning with blades and summer pruning with knives, controls growth and promotes heavier cropping. Used in conjunction with the Darwin Thinner on fruit wall systems optimises the labour savings and delivers more quality fruit. The ProbotIQ Xpert package is an add-on system for Fendt Vario tractors allowing the tractor to drive and operate autonomously. It is basically a robot that you teach and it plays back everything you have taught it! This system has been working since 2011 in Europe and will shortly be working in the UK. Due to the reduction of chemicals available, mechanising weed control is becoming necessary. Variable width or swing wing mowers are a popular choice, options include a hydraulic sensor bar to work in and around plantings - Ladurner single or double sided cultivators with rotary heads and automatic tree sensing. Using the Braun Rollhacke finger weeder we are working on a wider version for orchards. 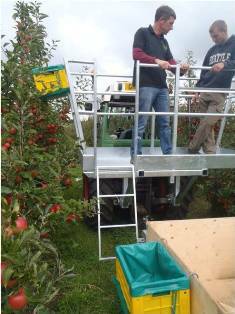 The unit is mid mounted and can be used at the same time as other orchard operations for efficiency, it is adjustable in depth, pitch and angle. The Braun Rollhacke has a working speed of 3 MPH up to around 7 MPH and it is simple to use!